As Wikipedia goes on to note, “Today the term is often used in a pejorative sense, to refer to an excessively narrow focus on factual historical trivia, to the exclusion of a sense of historical context or process.” But here we want to salute Francis Peck with the original meaning of antiquary, teasing history from empirical objects rather than theory, which sounds like a noble practice to me. Desiderata Curiosa: Or, A Collection of Divers Scarce and Curious Pieces Relating Chiefly to Matters of English History. Consisting of Choice Tracts, Memoirs, Letters, Wills, Epitaphs, &c. Transcribed, many of them, from the originals themselves, and the rest from divers ms. copies, or the ms. collections of sundry famous antiquaries and other eminent persons, both of the last and present age: the whole, as near as possible, digested into an order of time, and illustrated with ample notes, contents, additional discourses, and a complete index. 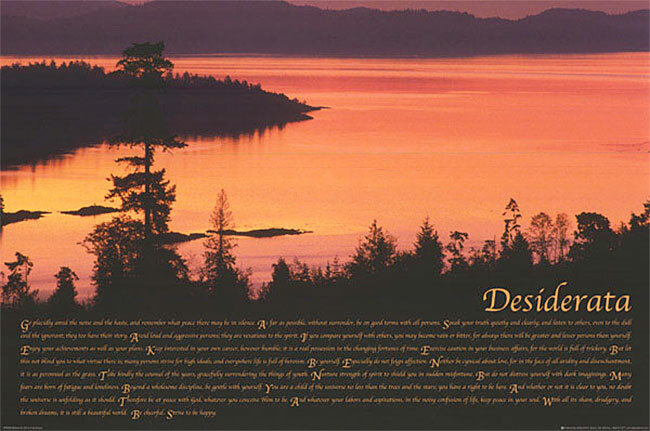 …the Reverend Frederick Kates, rector of Saint Paul’s Church in Baltimore, Maryland, included Desiderata in a compilation of devotional materials for his congregation. The compilation included the church’s foundation date: “Old Saint Paul’s Church, Baltimore A.D. 1692.” Consequently, the date of the text’s authorship was (and still is) widely mistaken as 1692, the year of the church’s foundation. Some good advice (“avoid loud and agressive persons”), some repression (“do not distress yourself with dark imaginings”), some nice thoughts (“it is still a beautiful world”) and even a foreshadowing of the coming Beat, Zen, Hippy, New Age and 2001 “star child” movements and memes (“You are a child of the universe, no less than the trees and the stars”). Still, though, a niche piece of work (“if you can get it /And you can get it — if you try….” sorry), until 1965, when former Illinois Governor and two time Democratic nominee for President Adlai Stevenson up and died, and “a guest in his home found the Desiderata near his bedside and discovered that Stevenson had planned to use it in his Christmas cards (Wikipedia: Adlai Stevenson II). The ensuing publicity caused Ehrmann’s Desiderata to jump the shark and become a meme in the cultural soup, perfectly timed for the breaking wave of late-1960s hippydom. Star Trek’s Commander Spock himself, Leonard Nimoy, recited the poem as “Spock Thoughts” on his 1968 album, Two Sides of Leonard Nimoy. Once again, that confusion about this being an anonymous 17th century church document likely kept Ehrmann for getting credited as the originator of “Spocks Throughts.” But the culture was not yet through squeezing words of wisdom from the Desiderata sponge. Les Crane (1933 – 2008), “born Lesley Stein, was a radio announcer and television talk show host, a pioneer in interactive broadcasting.” During his radio days, Crane broadcast from a studio at the hungry i, a San Francisco nightclub that was a launching pad for performers like Mort Sahl, Woody Allen, Barbra Streisand and Lenny Bruce. And according to a 1990 interview with Casey Kasem, Crane was one of the people “responsible for creating the Top 40 (list of the most requested pop songs).” In 1963, Crane moved to television, joining ABC’s flagship station in New York. Everyone knows about the Beatles first American television appearance on the Ed Sullivan Show early in 1964, but the first American TV appearance of The Rolling Stones was on Crane’s program in June 1964, though, unfortunately, only New Yorkers could see it. Crane was a controversial innovator in late-night television in the 1960s, and his Wikipedia biography is well worth a read. 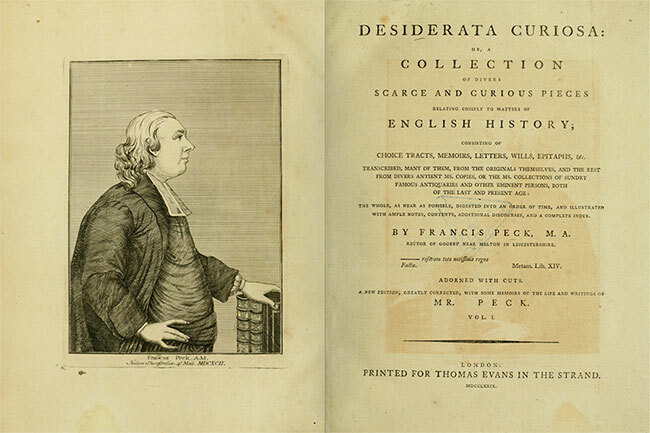 Read the full text of Francis Peck’s book, Desiderata Curiosa, on Archive.org. New York Times obituary of Les Crane, July 15, 2008. Ginger trivia: Les Crane was married five times. His fourth wife was the actress Tina Louise, whom he met and married while she was at the height of her popularity as the glamorous sexpot Ginger on the 1960s sitcom “Gilligan’s Island.” The marriage lasted five years. The name of Crane’s fifth wife, for the last twenty years of his life, is Ginger. Here’s a nearly 15-minute audio (again, no surviving video) of Les Crane’s television interview with Bob Dylan, from 1965: ABC’s Nightlife with Les Crane and guest Bob Dylan. It’s pretty funny, though you can see why Crane lost the late-night battle to Johnny Carson.